Hello, my name is Mark Watson and yes, I wear orthotics. I have to admit; getting that off my chest feels somewhat liberating or does it? Let’s face it we runners love to talk about our sport. We drop everything to describe the finer points of tempo splits, shoe weight, PBs, taper nutrition, goal setting and even injuries but orthotics, well we’d rather not. I got mine after breaking down pushing too hard, too soon around a year ago. I paid the earth for them and while they took some getting used to they’ve enabled me to ramp it up from 50 km per week to now running over 90. But real runners, those on the brink of qualifying for Boston wouldn’t dream of using them. Now that Ive sown that seed, its time to get rid of them. 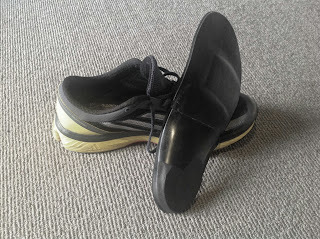 Most of us with any shred of common sense would figure that the adjustment to no orthotics needs to be gradual. Most of us however doesn't include me. Off I went on my long run last Sunday minus one ‘raggedy’ pair of orthotics and I felt great. I ran 30k in 2.24.13 at 4.48 pace. Well on Tuesday the proverbial hit the fan. Pain started to set in at the base of my left little toe and has progressively got worse. Could this be career ending? I think that maybe this is the result of more room in the toe box. I ran only on Tuesday and rested up the remainder of the week. I felt bad with every run missed and for my troubles got zero sympathy from anyone. "It’s my little toe and it’s important" I said to anyone who would listen. Masahiro Nagasaki and I first became friends back in 1996 when I lived in Japan. In those days we were both rather unhealthy specimens. He was overweight and I smoked and drank to excess, at least that’s how I remember it. As phases come and go we later embarked on a new one together. To run, get fit and finish a full marathon. We ended up running a bunch of races including 3 full marathons together before I returned to New Zealand in 2000. He and I remain good friends and we both still run. Last week Masahiro emailed me to say he’d entered the March 2014 Tarawera Ultra Marathon here in Rotorua which got me excited and thinking … This post is already way too long. Ill leave these wacky 'Ultra' thoughts for next time. Have a great week everyone. I really enjoyed that video link. Yes, classic video - good acting. Don't tell Scott, but I admit to seeing runners up ahead with good looking butts only to find out they were blokes. Good long run! Probably was the extra room in the shoes. If there's nothing broken I'm sure you'll get used to it. Marathon training will get you through the ultra so no need to go over to the dark side.